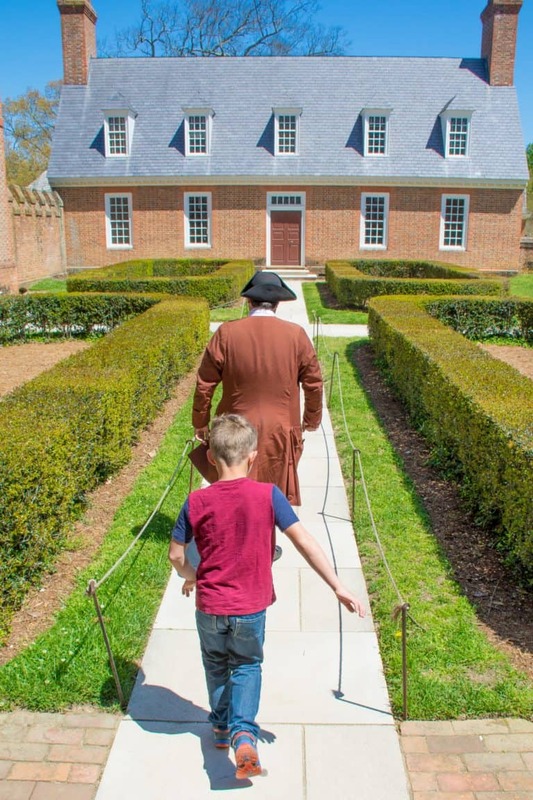 Has Historic Williamsburg, VA been on your family vacation short list for years? Why haven’t you made the trip yet? Maybe a visit to America’s Historic Triangle of Jamestown, Williamsburg and Yorktown sounds too much like a school field trip with not enough fun and relaxation. The secret of this popular Virginia family vacation destination is that it’s not all about the history. 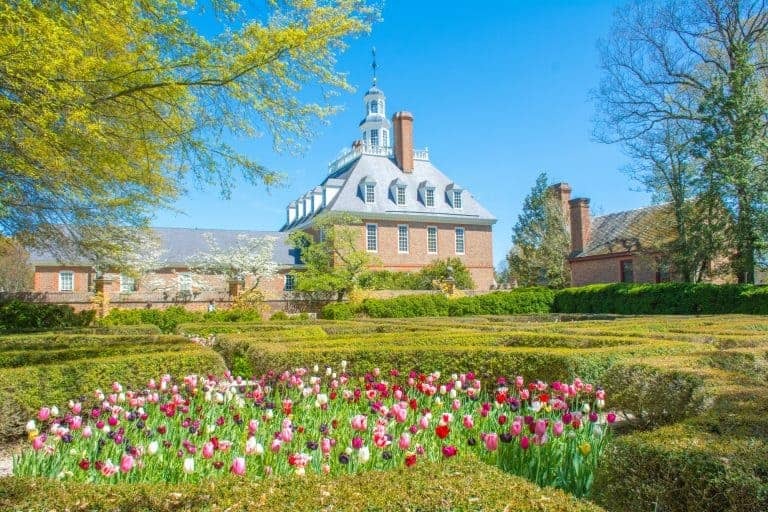 There’s so much more to see and do in Williamsburg, Virginia. Williamsburg, VA is home to Busch Gardens, one of the most beautiful amusement parks in the United States. Busch Gardens has its fair share of thrilling roller coasters too! The adventure seeker in your family will certainly be satisfied. The city center of historic Williamsburg is packed full of restaurants to please the foodie in your family and is also home to the annual Williamsburg Taste Festival every spring. Finally, Kingsmill Resort, a top family-friendly resort complex complete with a huge outdoor pool, is also just a few miles from the center of historic Williamsburg, VA. A stay at Kingsmill Resort turns a trip with the family into a true relaxing vacation experience. 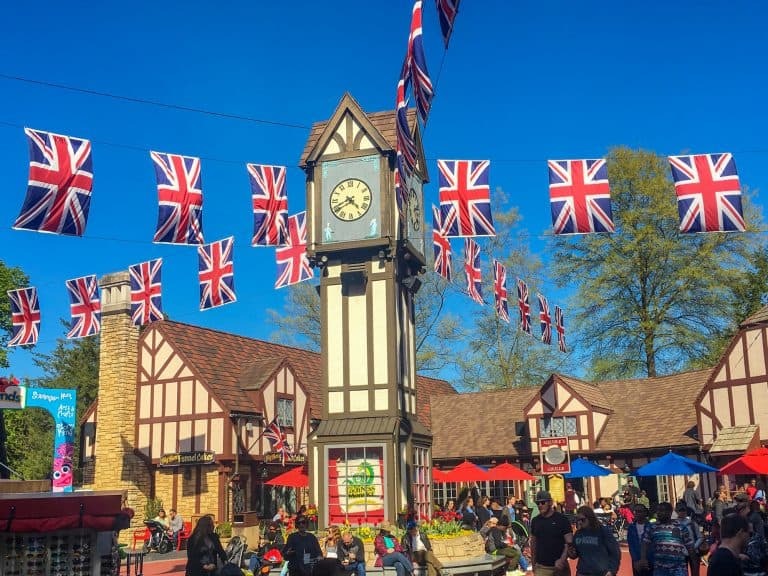 Enjoy a trip around the world at Busch Gardens Williamsburg. Eat gelato in Italy. Help save the Irish fairies on a virtual reality ride, Battle for Eire, in Ireland. Relax with a beer while the band plays in Oktoberfest. Twist, turn and flip over an Alpine village on the Alpengeist roller coaster. Take the little ones to meet the characters in Sesame Street ® Forest of Fun ™. On our most recent trip, my 8 year old discovered a love for roller coasters for the first time on the Viking-themed Invadr coaster which reaches speeds of up to 50MPH and includes a thrilling, 74-foot drop! Each season is special at Busch Gardens. In the spring, see the tulips bloom and celebrate the season in one of the most beautifully-landscaped theme parks in the United States. No doubt, summertime brings hot weather to Virginia; cool off on the water rides like Escape from Pompeii. Fall brings cooler temperatures and Halloween scares, while winter brings millions of lights as Christmas Town festivities delight. Considering to spending your holidays in Williamsburg? Check out Trekaroo’s Guide to Spending the Holidays in Williamsburg. 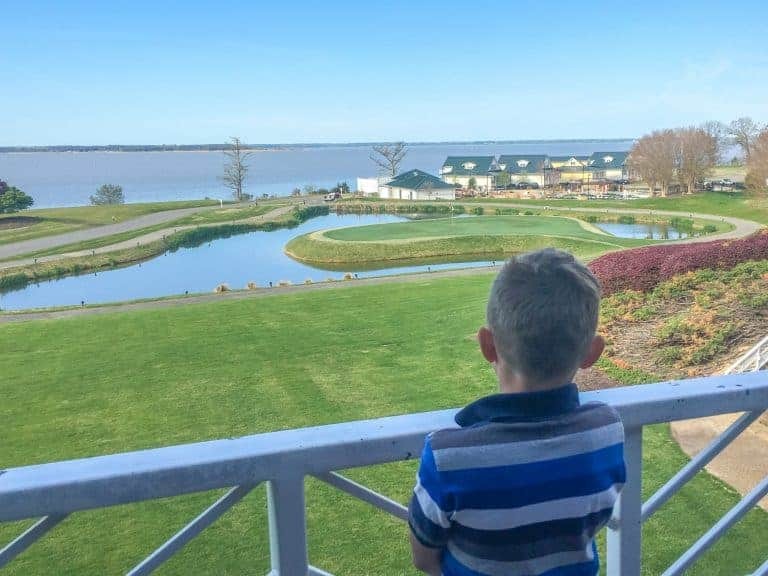 Located on the banks of the James River with a fantastic view from practically every room, suite and condo, Kingsmill Resort is one of my favorite family-friendly properties in the Mid-Atlantic. I have great memories of spending an evening poolside relaxing while my children played in the lazy river. We ate nachos and chicken strips for dinner as I watched the kiddos taking turns going down the slides. Kingsmill Resort is really a place for relaxation in any season. 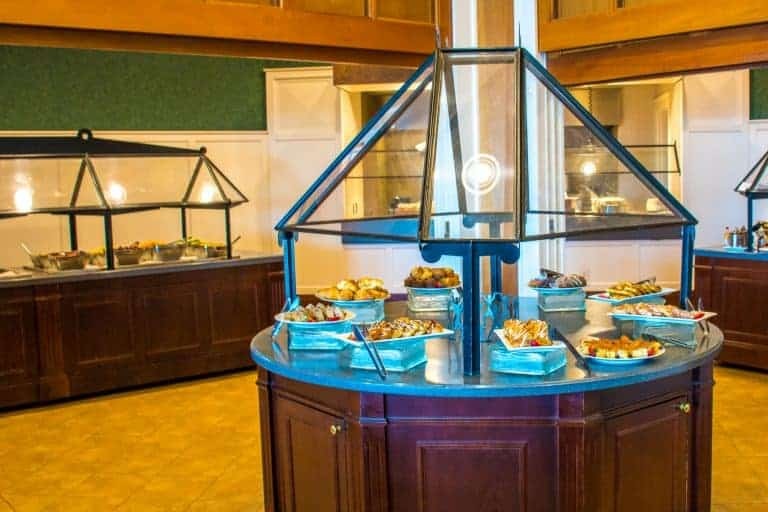 The restaurant serves a lovely buffet breakfast including fresh fruit, tasty pastries and sweets, crispy bacon, and omelets for guests on the breakfast package. For parents who like to set their early-rising tots up with a bowl of cereal and cartoons; there are condos available with full kitchens too. This spring, my son and I enjoyed a 5-mile bike ride beneath the blooming dogwood trees around the resort property. There are also award winning golf courses. For many families a vacation is not complete without good food. I like to enjoy a fantastic view during my meal. 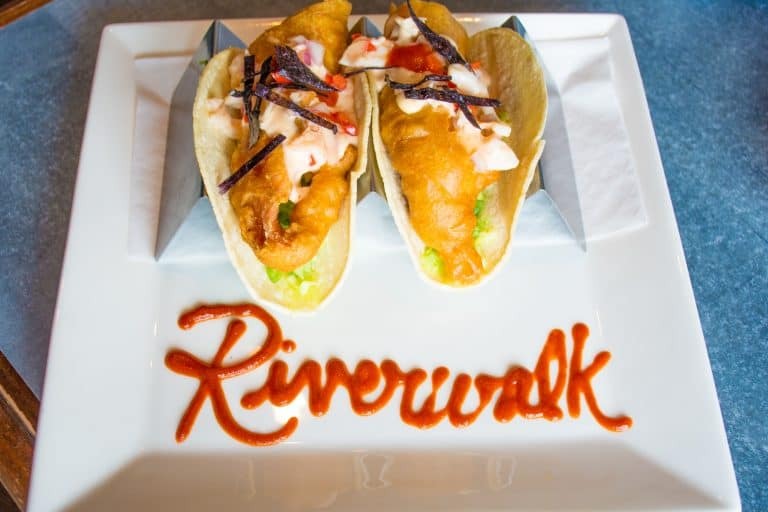 Fortunately, many of the restaurants along the Yorktown waterfront offer both yummy food and views of the York River. My son and I enjoyed lunch at the Riverwalk Restaurant in Yorktown during our stay in Williamsburg. As recommended to me, I tried the spaghetti squash tater tots; who knew veggies could taste so good? Spring is certainly my favorite season to visit Williamsburg. This April, I was fortunate to make a visit during the Williamsburg Taste Festival; the temperatures were mild and the tulips and dogwoods were in bloom. At the festival’s Friday night Street Beats event, my son and I had great time playing giant Jenga and Connect Four while bands played in the background. 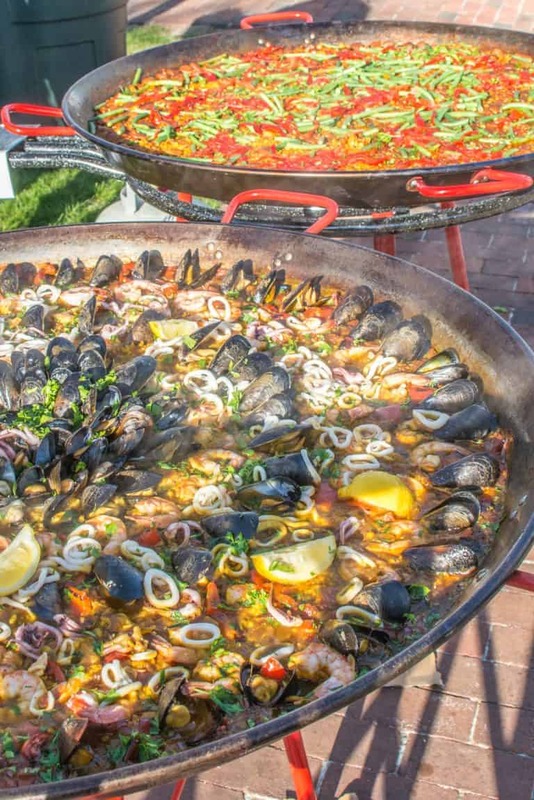 We sampled food from some of Williamsburg’s best restaurants and food trucks, with the highlight being two giant pans of paella from La Tienda. On Saturday we returned to downtown historic Williamsburg for the Culinary Village event featuring tastings of local beer, mead, and wine, as well as small plates from almost a dozen Williamsburg restaurants. The event also included lectures and cooking demonstrations. There’s enough living history in Williamsburg to keep your family busy for days. 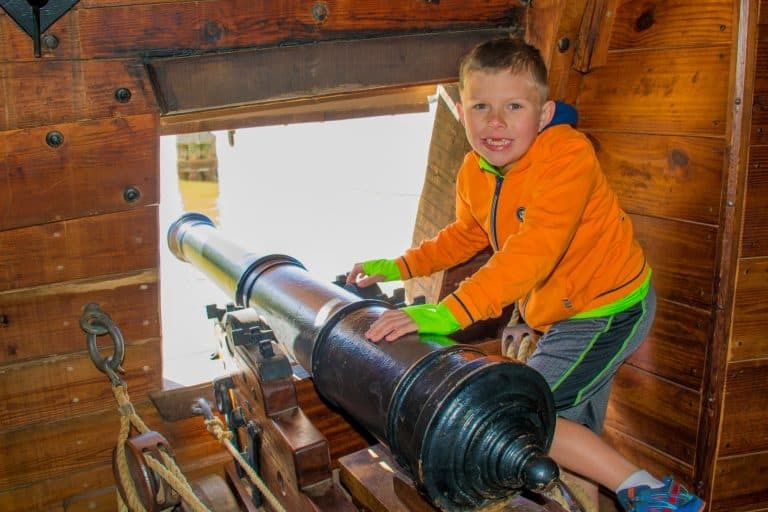 Jamestown Settlement, Colonial Williamsburg, and the American Revolution at Yorktown all have something different to offer families looking to experience 17th and 18th century American history. After several visits, I can confidently say that Jamestown Settlement is my favorite living history venue in the region for children under the age of ten. 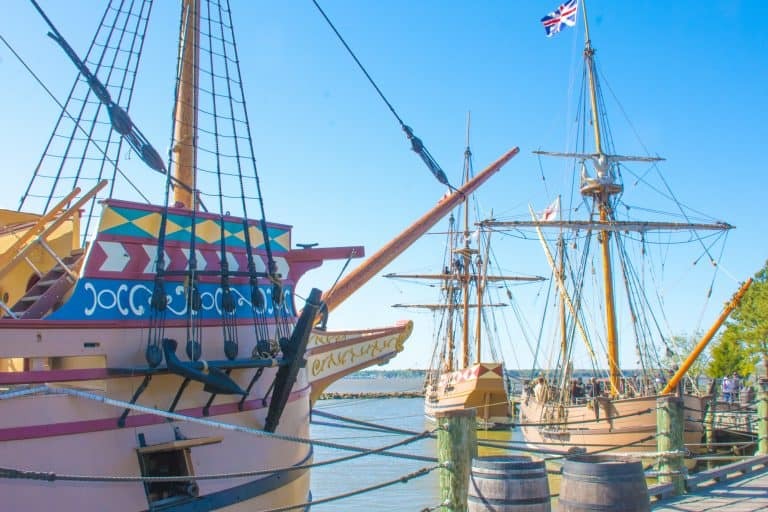 This living history museum, located just down the road from the actual archaeological site at Historic Jamestowne, has a museum, Powhatan Indian village, fort, and ships. On our most recent visit, my 8-year-old son excitedly ran up and down ladders and from ship to ship. Fortunately, a docent dressed as a member of the ship’s crew stepped in. She encouraged my son to touch everything in sight and gently guided him towards a few objects for a history lesson. Over and over again, the staff pulled my son in for a history lesson despite his original reluctance to participate. He a lot of fun playing games in the Native American village too. Of course, he was begging to go back the moment that we left and during the rest of our visit to Williamsburg. 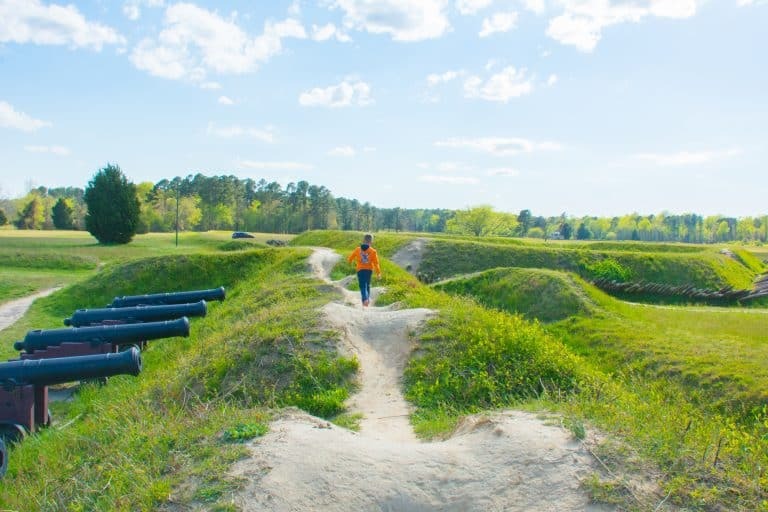 For those that love a good history lesson, the guided archaeological tours at Historic Jamestowne on Jamestown Island are the best. 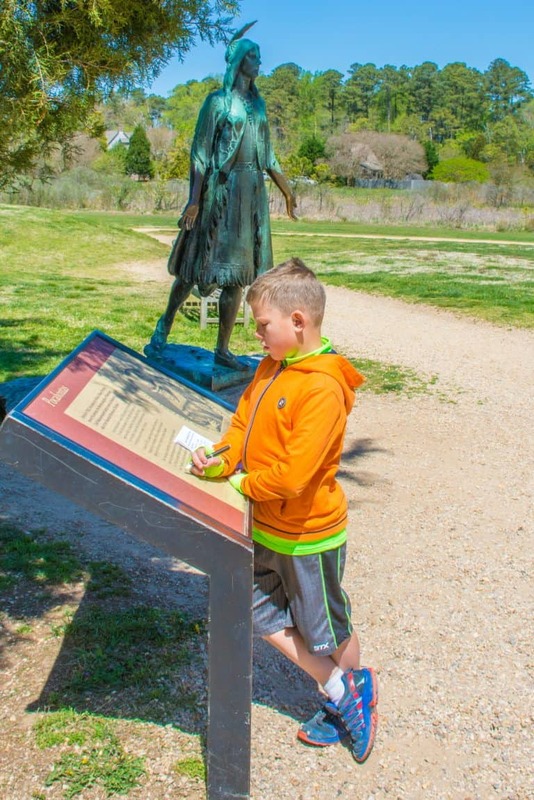 These lectures about the first permanent English settlement in America may not spark an interest for the youngest visitors, but if you already have a young historian or archaeologist in your family, these knowledgeable historians share their love of the site with fantastic storytelling ability. Of course, Colonial Williamsburg, likely America’s most recognizable living history site, is the draw for most families visiting the region. Even without a ticket, families can stroll the streets of the historic area, watch carriages driving the streets of town, take a photo of their children in the stocks, and watch the army march down the main street. However, to really soak in the history and participate, families will want to check the calendar to plan their visit and purchase a ticket, which allows visitors to go inside the buildings, speak with shopkeepers, and take tours. 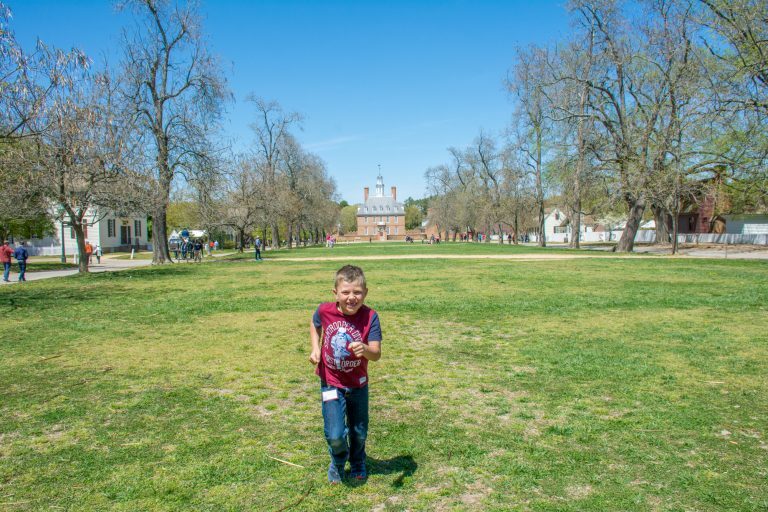 A visit to Colonial Williamsburg can be a bit overwhelming because there is simply so much to do. I’ve found that it’s best to just wander and see what sparks my family’s interest. Check the calendar for any must-see events that might be happening the day of your visit. My favorite building and tour is the Governor’s Palace. The tour changes seasonally so it is never the same. In April, our tour guide discussed the final British Governor’s flight from the capital city as the Revolutionary War began. In December, our guide described the holiday festivities, balls and banquets. Don’t forget to visit the gardens out back! Driving the Colonial Parkway out to Yorktown is one of my favorite parts of a visit to America’s Historic Triangle. The Yorktown area is often overlooked by families visiting Williamsburg. Both times that I have visited Surrender Field at Yorktown Battlefield, the actual location where Cornwallis’ British army ceremoniously laid down their arms at the end of the Revolutionary War, my kids and I have had the place to ourselves. 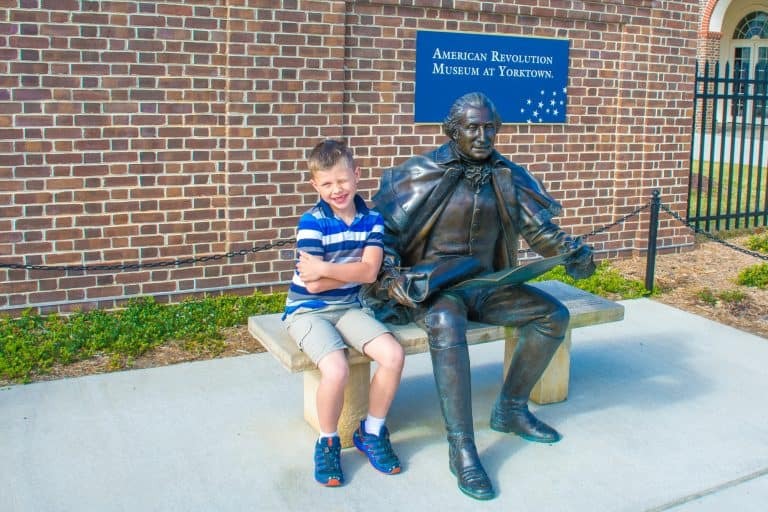 The American Revolution Museum at Yorktown, the newest attraction in the region, had only a few visitors on our Sunday morning visit this April. The museum itself is modern. There were enough interactive exhibits to keep my 8 year old busy, but the target audience is obviously those who already have some familiarity with Revolutionary War history. Outside there is a living history Revolutionary War encampment and farm. We learned about battlefield medicine and posed for a photo-op with General George Washington. This post was sponsored by Visit Williamsburg. No specific opinions were asked to be expressed by the sponsor and the author’s resulting coverage is unbiased. All photos by Melissa Moore unless otherwise credited.